We almost just arrived home after our yearly visit at my mother-in-laws-house in Basque Country. This year (just like last year) we took a few days of trying awesome veggie eateries. This time we had a closer look at the veggie pintxos of Bilbao, a completely vegan “pastelería” (cake shop) and a vegan bar serving lots of Japanese inspired goodies and much more! 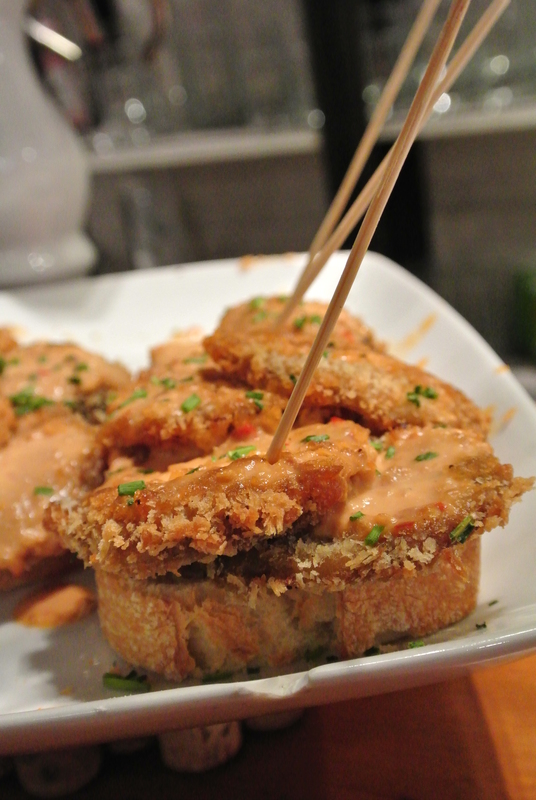 A few words need to be said about Pintxos. 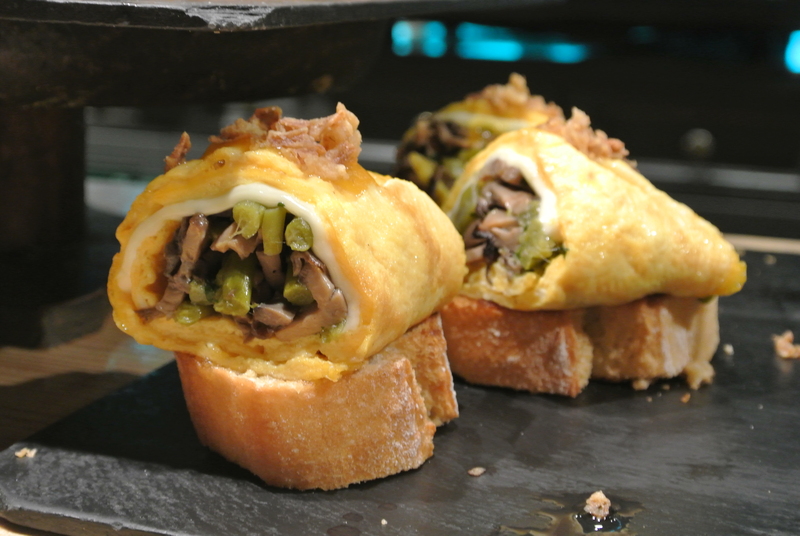 Pintxo is the Basque version of tapa and is a snack often served on a small piece of bread with a skewer stuck into it. 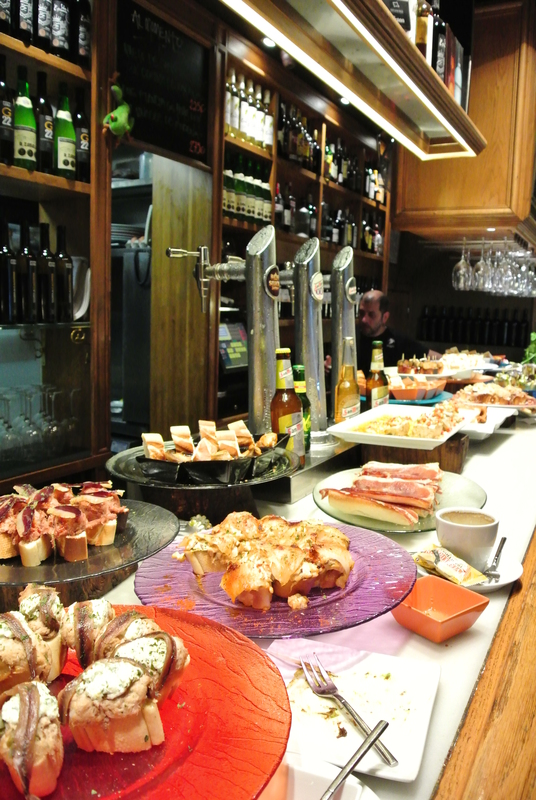 Pintxos are normally eaten as a snack at the bars before lunch where people meet and hang out. 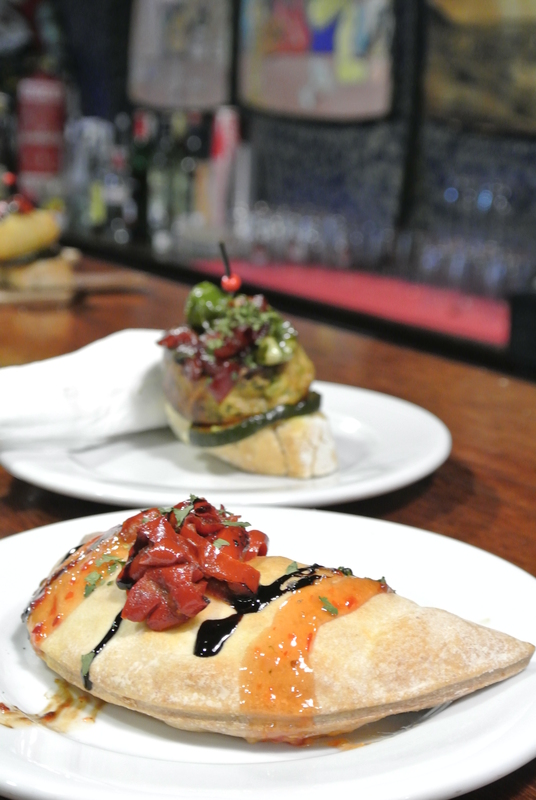 You may find pintxos at the bars even after this hour but maybe not the same selection of them. As a vegan or vegetarian you may feel a bit left out when your friends try one yummy pintxo after the other and when all of them contain either meat, fish or seafood. 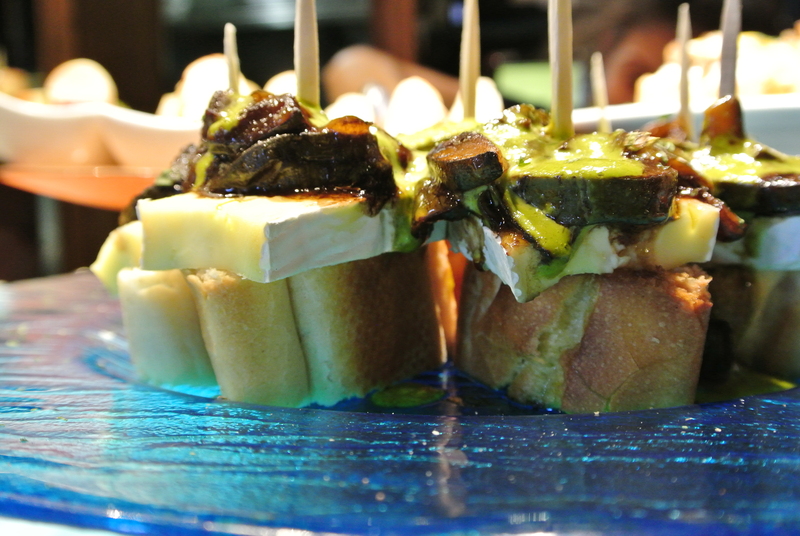 To our big joy we have recently discovered that in Bilbao (the biggest city in Basque Country) there are several bars that are either specialized in veggie pintxos or have a few high quality pintxos in their selection. Below we list all the places that we tried this year and that we think are worth a visit. 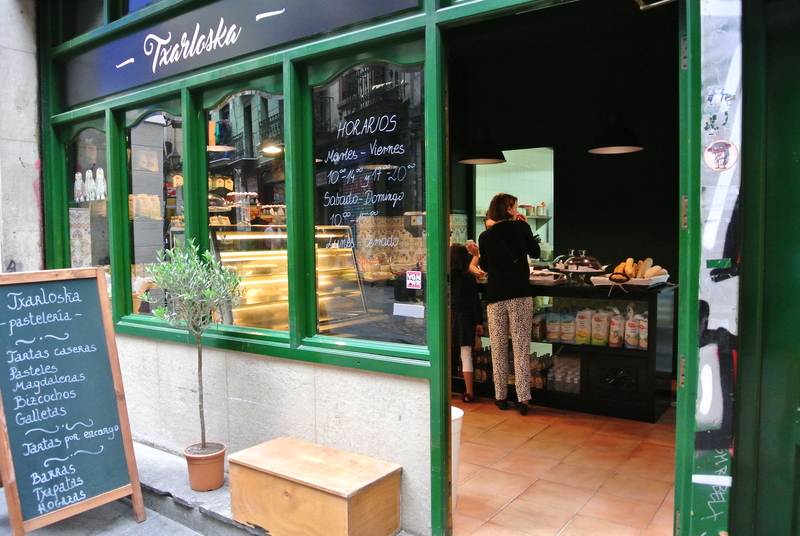 Txarloska – a vegan pastelería (cake shop) that sells delicious looking cakes! 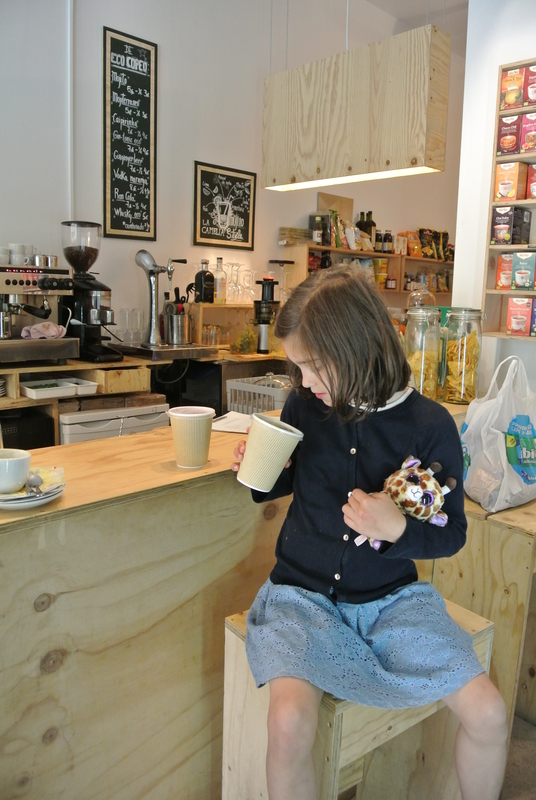 This is the first shop we have ever been to that only sells cakes completely free from ingredients with animal origin. 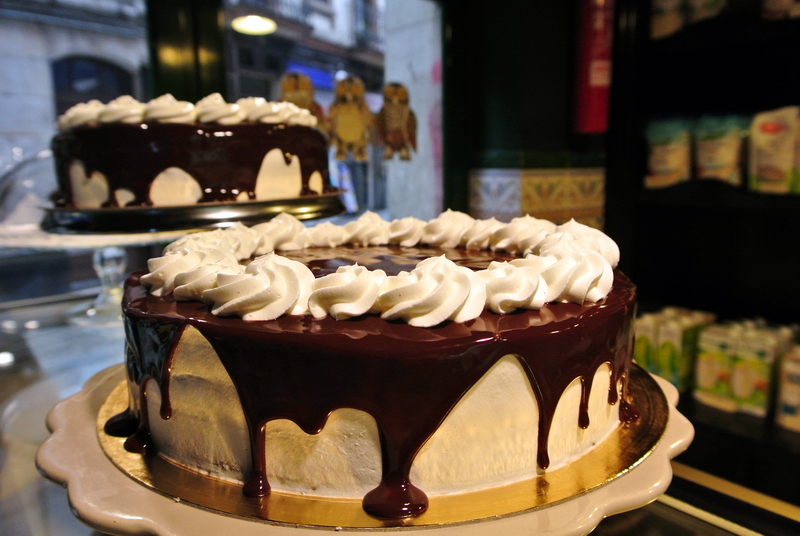 Txarloska is a very sweet little shop with the most incredible cakes and the most friendly staff. The owner also had a lot of yummy suggestions of where to have more vegan culinary experiences in the city. 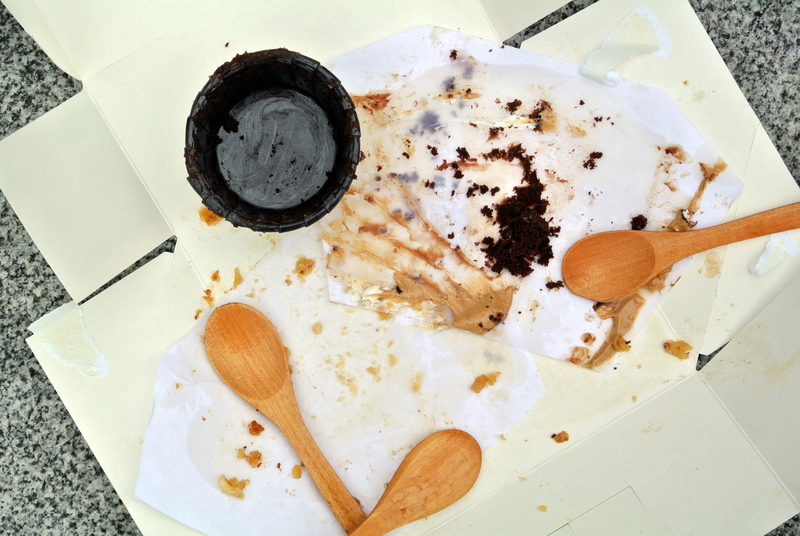 Obviously we tried some of cakes and I can tell you that one of them was the best cake I have ever had! 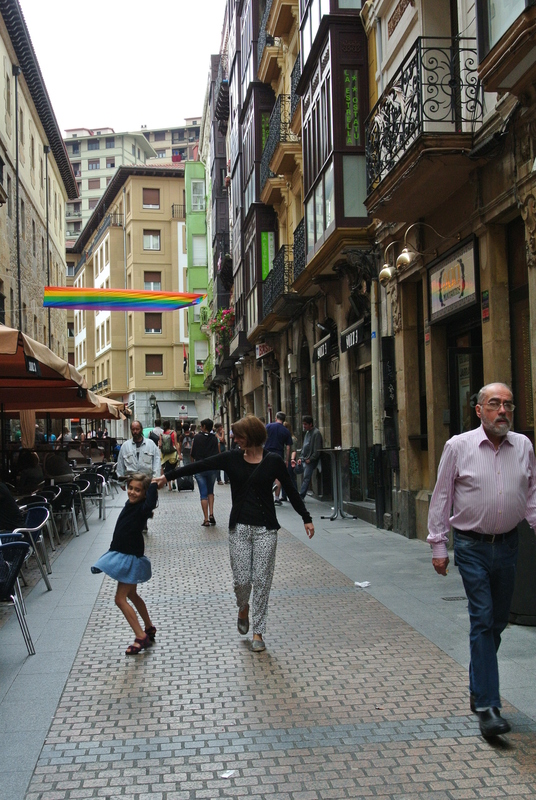 K2 – is a bar situated in the old part of Bilbao (just like Txarloska) in a street called Somera. 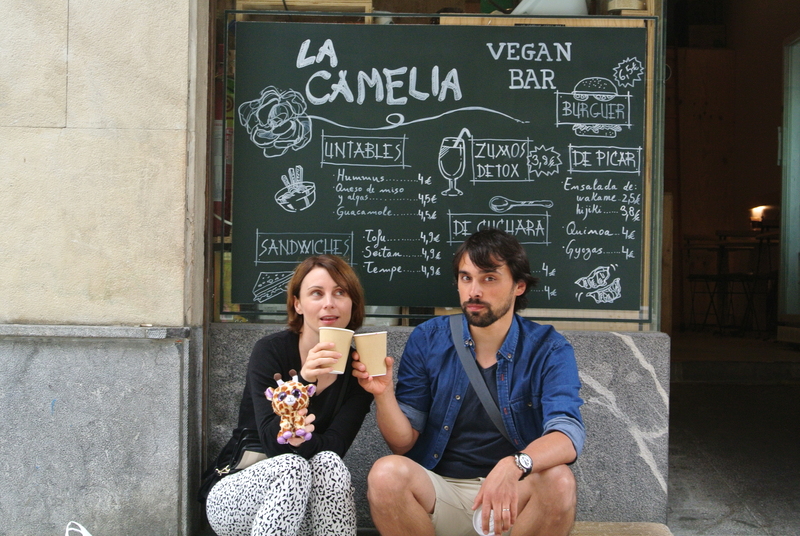 In this street you will find more than one bar that has vegan pintxos. A girl working at K2 told us, that some time ago, there had been a competition between the bars of who could make the best vegan pintxo. After this many of the bars continued to sell vegan pintxos. K2 was the winner in the competition and the winning pintxo is presented in the picture above. We tried it and we were definitely not disappointed! 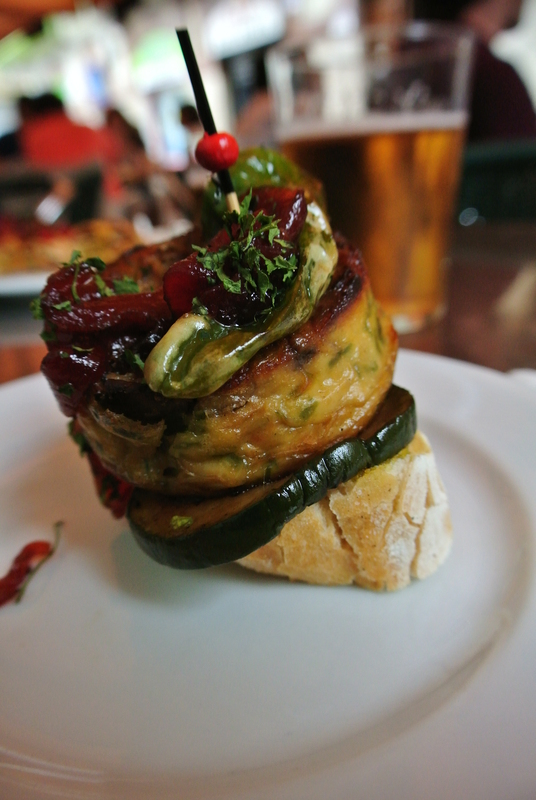 K2 always has a selection of both vegan and lacto ovo vegetarian pintxos. 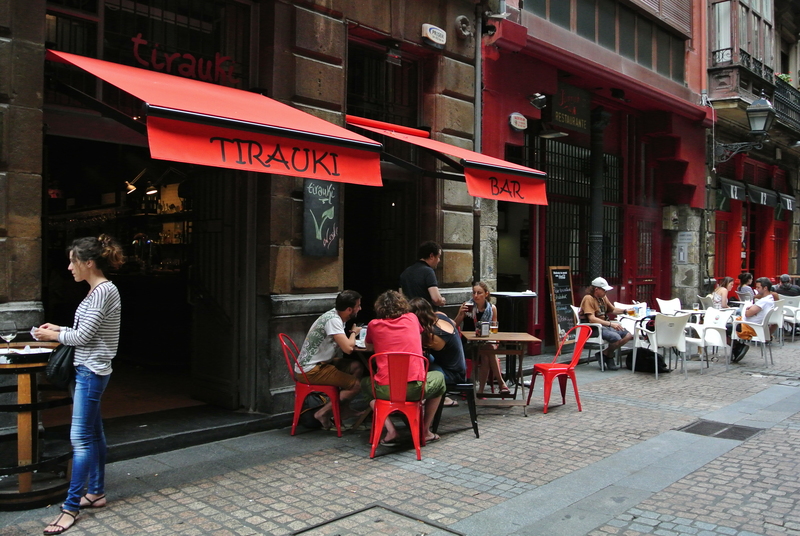 Tirauki – next to K2 you will find the bar Tirauki that serves almost exclusively vegan pintxos. At the time we were there I saw only two pintxos that were not vegan. It was so nice with such a big amount to choose from. This is not something you are spoiled with as a vegetarian. 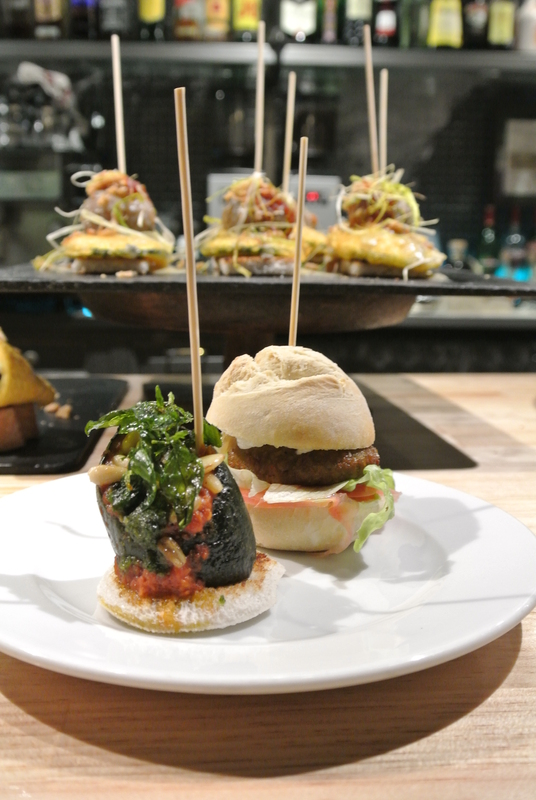 Muga – is a rock bar that serves veggie pintxos, sandwiches, hamburgers, salads and much more. I have written about Muga once before but I wanted to include it to this list too due to their big selection of veggie pintxos. La Camelia – a small vegan bar that serves (among other things) sushi and more Japanese inspired dishes, soups, cold pressed juices and cakes. Everything is vegan and most of it organic. They also have products available for sale like: tea, beverages, tofu, oil, Japanese delicacies and dry goods. 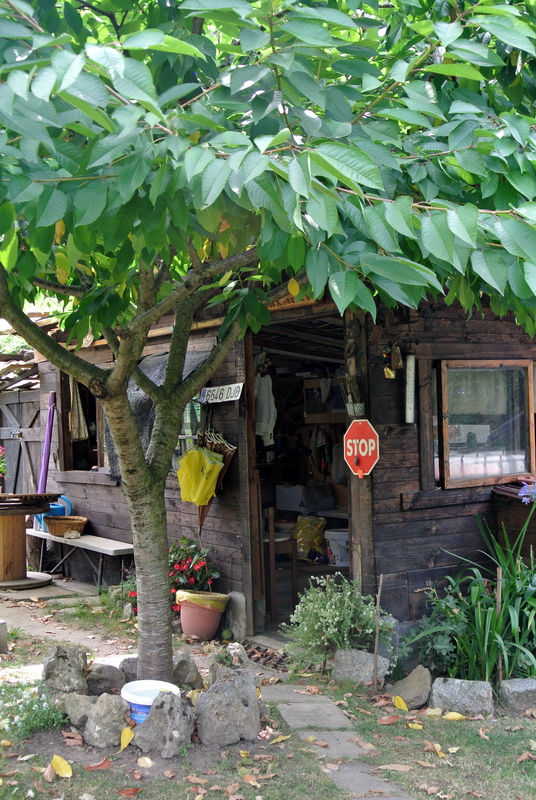 The interior is made by the owners themselves which gives the place a nice atmosphere. We tried some of their cold pressed juices and we give them the highest grade. They were delicious!! 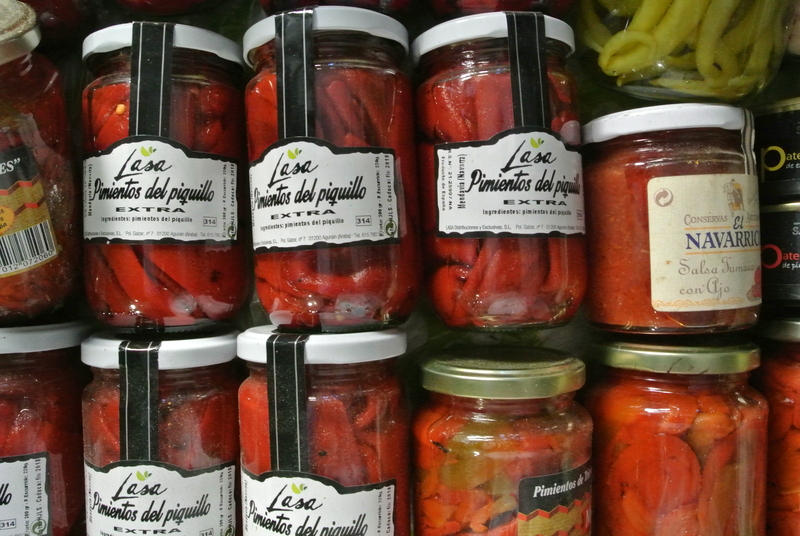 If you are interested in knowing more about vegetarian eating in Basque Country you may have a look here. Pintxos at the bar K2. Here you see the winning contribution (the one with zucchini) to the vegan pintxo contest. Eating pintxos makes you really happy! Outside the bar Muga the street performer had some serious competition. And while our daughter was entertaining we tried some delicious pintxos. I mean just look at it, I would like another right now! The street Somera had a lot to offer. Here the bar Tirauki. Tirauki had the biggest selection of vegan pintxos. 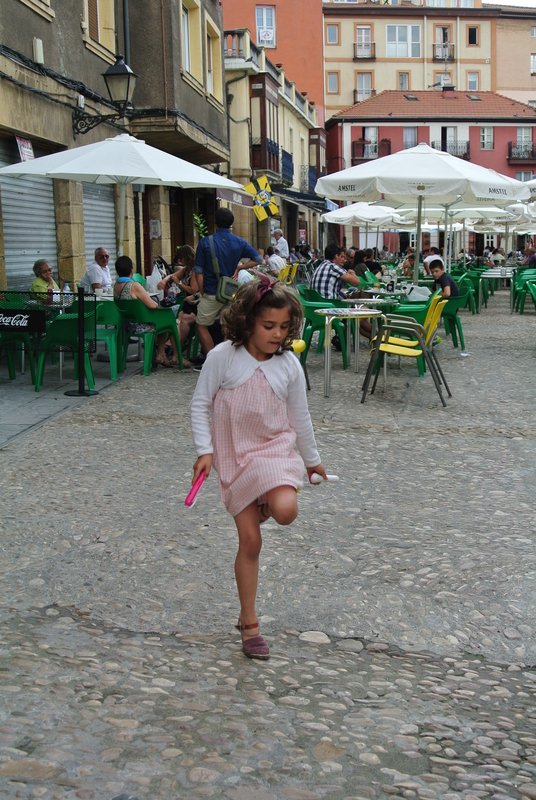 We arrived in the middle of the “pintxo rush hour” and when we left the bar there were almost not any left. The more typical one on a piece of bread with a skewer. Txarloska our new favorite cake shop! 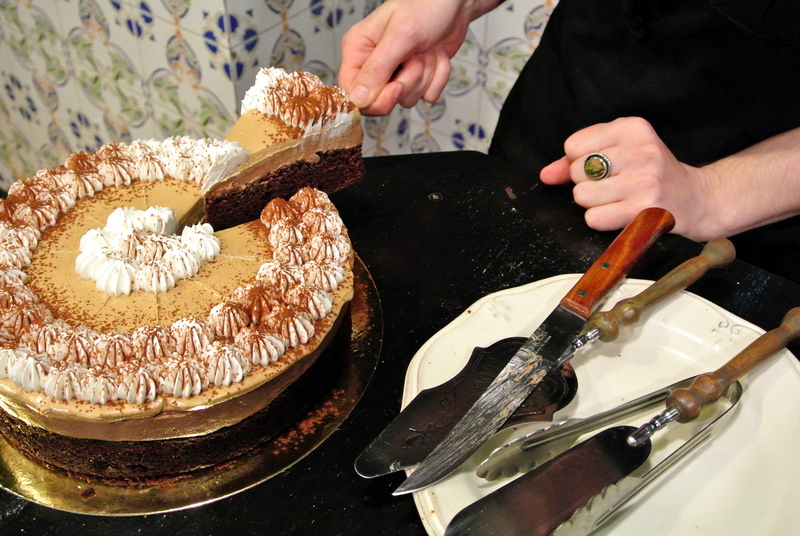 We had one piece of this coffee cake (or was it cappuccino? ), another piece of an apple cake and a chocolate cupcake. 30 minutes later in the park. I absolutely loved that coffee cake! Hello La Camelia vegan bar! Great juice and the best company. Inside the bar ordering juice. 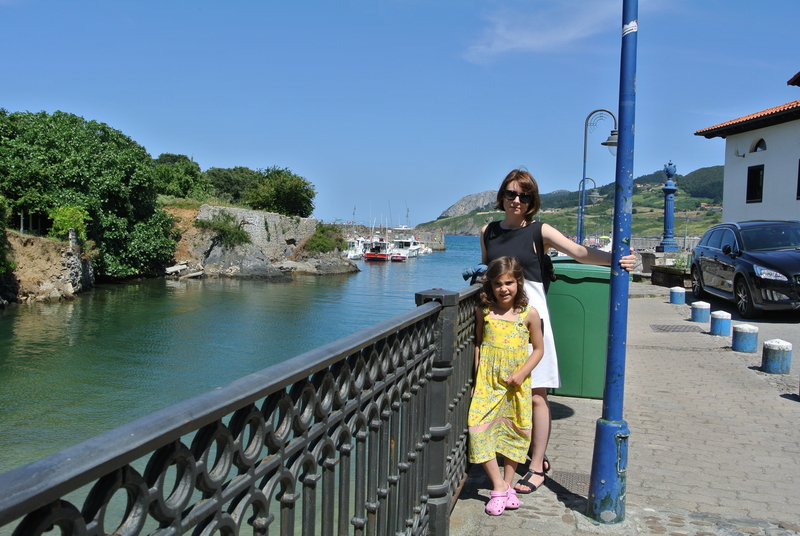 More than a week has past since we arrived back home from visiting family and friends in Basque Country. Finally I had a moment to go trough all of our pictures and I can ensure you there were many. I have been wanting for a while to share some tips for how to get the most out of this region as a vegetarian. 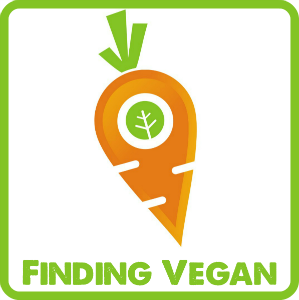 With this post I want to facilitate travelling in this area for all vegetarians and vegans. As I mentioned in an earlier post, it can be a challenge for a vegetarian or a vegan to visit Basque Country. If you rent an apartment you may of course prepare all meals yourself. But isn’t it nice not having to spend your holiday cooking and washing up several times a day? Although I find cooking highly pleasurable I sure do enjoy eating out during my holiday, getting some new inspiration for my green kitchen adventures. 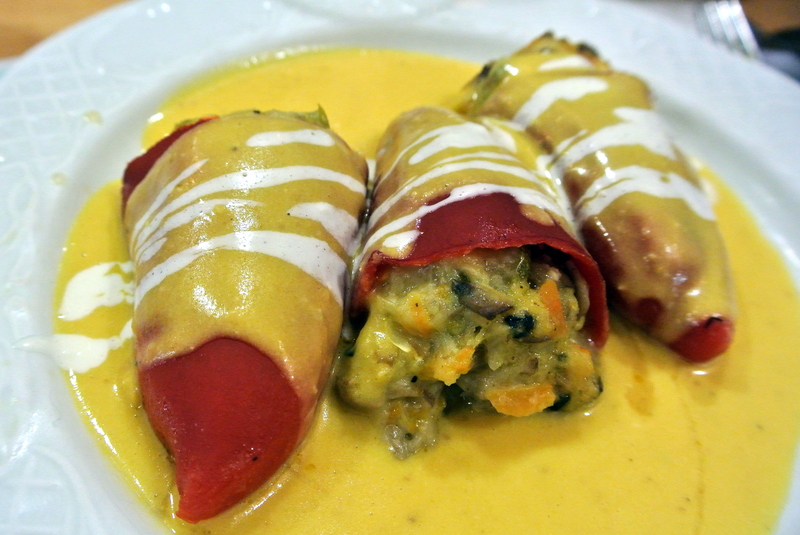 My experience is that in Basque Country (and here I refer to Basque Country only since my experience regarding the rest of Spain is almost non-existing) it is difficult to find vegetarian courses on the menu, and even more vegan ones. There are some great vegetarian and vegan restaurants that serves only vegetarian and vegan food but sometimes it is nice with a bit of selection, am I right? 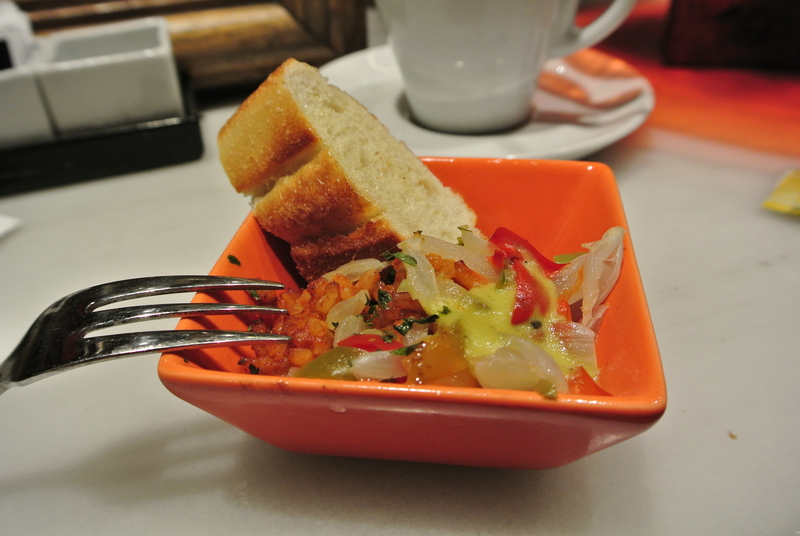 In bigger cities you may find places like salad bars and such but in smaller cities, or if you want to try more genuine Basque cuisine, it is good to know that there are options. Below I am sharing a small list of bars and restaurants that serve vegetarian and vegan food. There are of course many more places but these are the ones that I have been to, returned to and that I like to recommend to others. At Happy Cow you can find more vegetarian and vegan eatings in Basque Country and all around the world. 1. 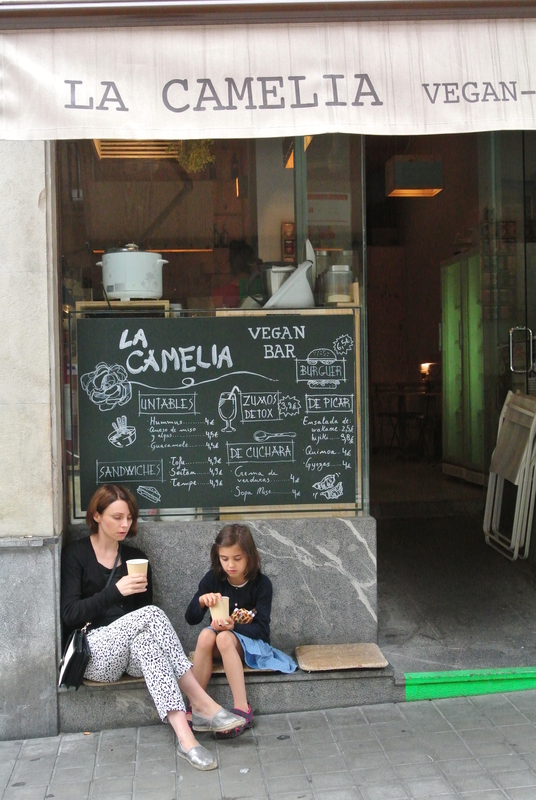 Garibolo – My number 1 vegetarian restaurant in Bilbao! They serve great vegetarian, regional food. If you want to try something genuine from the Basque kitchen I definitely recommend this place. You get great service and you have a lot to look at with the walls being covered in photos, paintings and curious stuff. The man who runs the restaurant is very friendly and always stops by the table for a quick chat. 2. 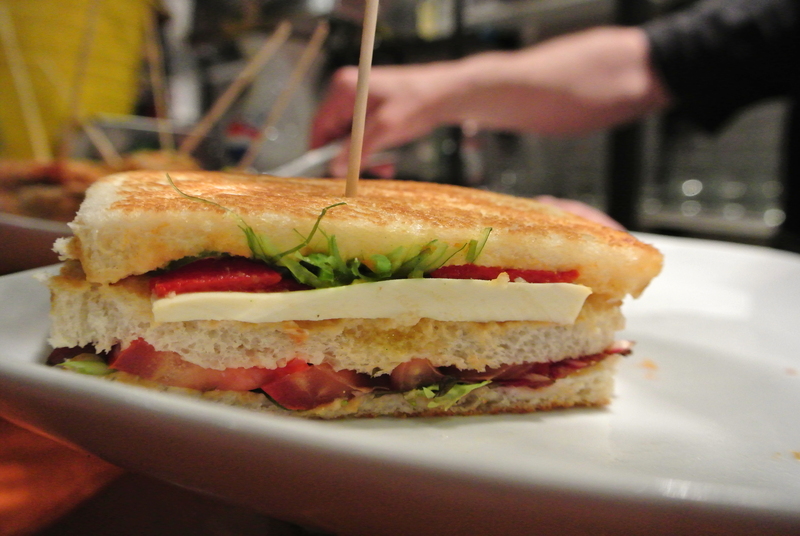 Muga – A vegan bar that serves different types of sandwiches, bocadillos, pintxos, hamburgers and other smaller dishes. While enjoying your meal you get to listen to some Rock Radical Vasco! 3. Borne – A small vegetarian and vegan friendly restaurant that also have meat on the menu. I have only been to this place once but I will never forget it. I believe It was one of the tastiest vegan meals I have ever had! 4. 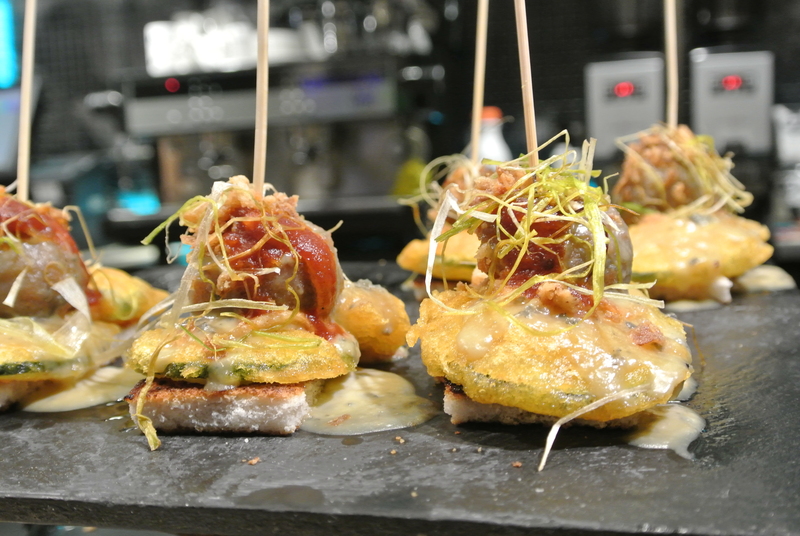 Zuga – This is the place to go if you want to eat pintxos. Pintxos is the Basque version of tapas (this is my definition) and are often served on a small piece of bread with a stick. 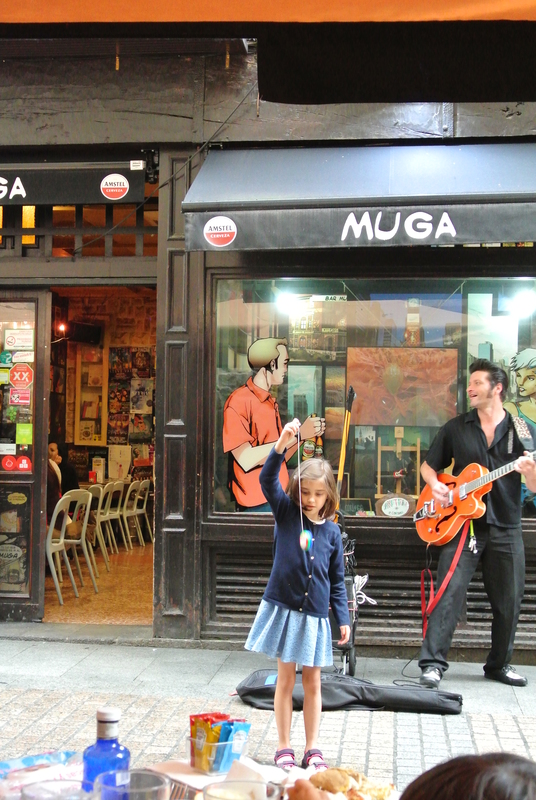 Zuga is a bar situated in the famous Plaza Nueva of Bilbao. Zuga always has some vegetarian pintxos. 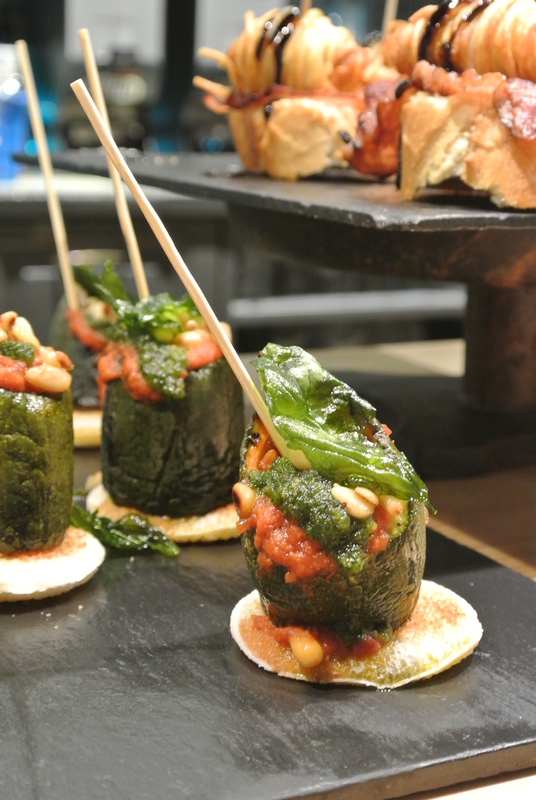 There are lots of bars around Plaza Nueva that offer the most incredible pintxos. It’s an experience just walking around having a look inside the bars. 5. 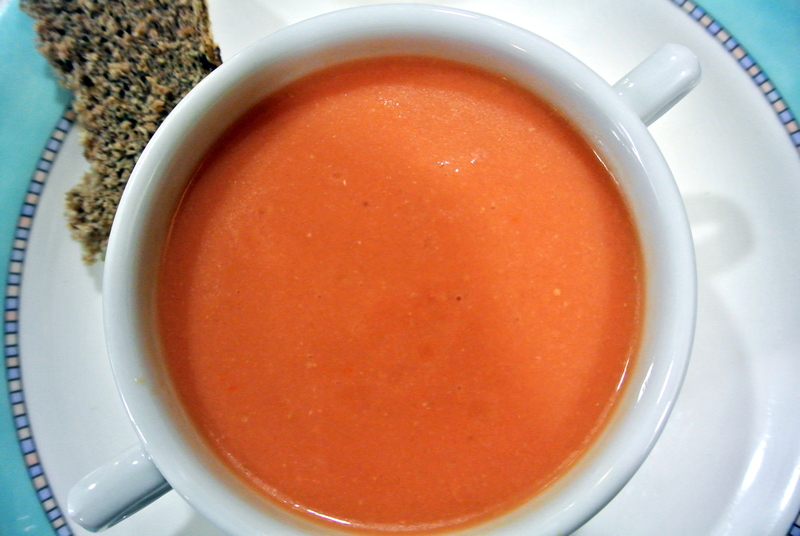 Landare – A vegan restaurant in San Sebastian that cook with seasonal produce. The food is wholesome, well balanced and nutritious in a very tasty way! 6. Finally I would like to add Raciones to my list. Racion is the spanish word for portion and if you order a racion you get a portion of food. 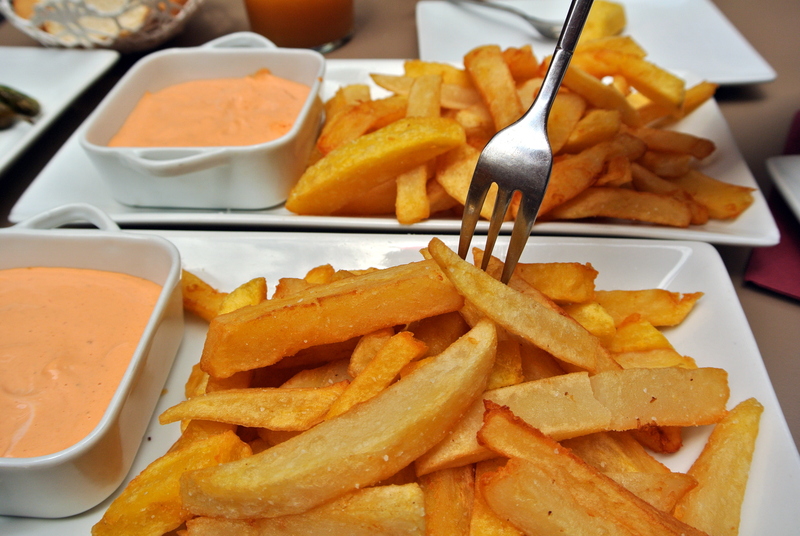 Many bars have a list of raciones on their menus and one of the most typical once is Patatas Bravas. If you want something vegetarian to eat at a bar your best chance is the to have a look at the raciones. A few vegetarian raciones I have tried are: croquetas, pimientos verdes, patatas fritas, patatas bravas, ensaladas and queso. 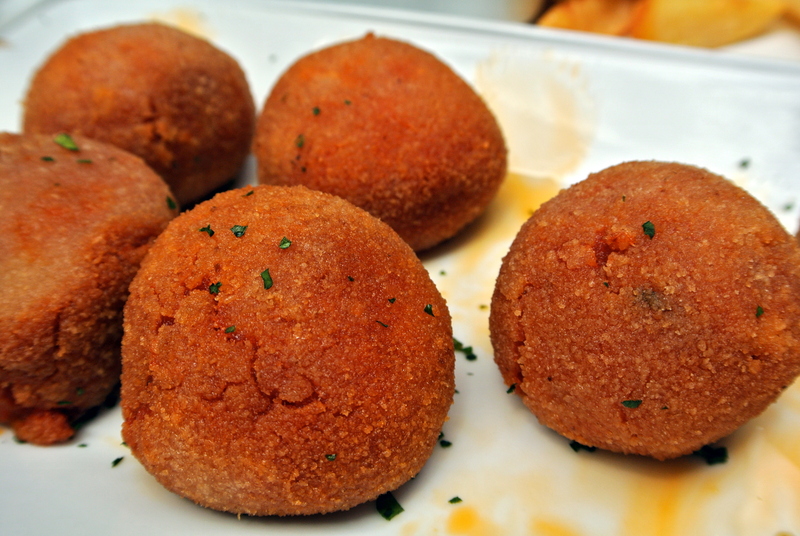 For lunch you could for example order a few raciones instead of having a formal restaurant meal. 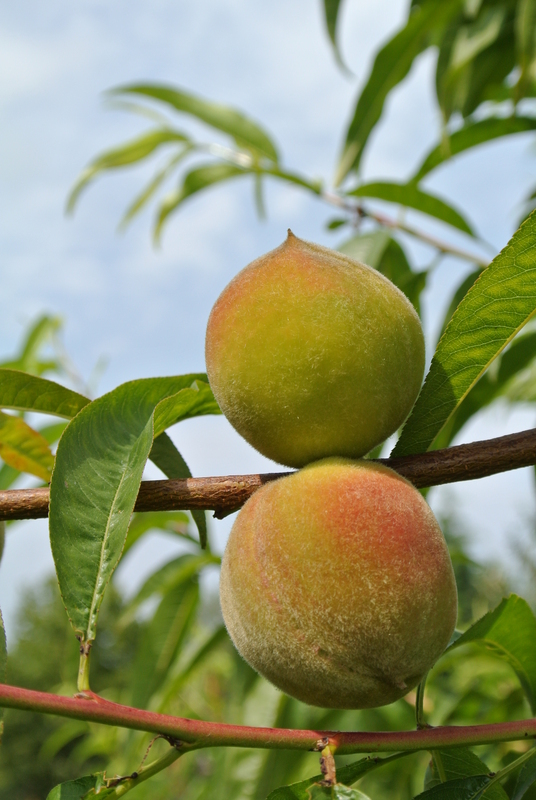 Beside what’s mentioned above, the whole region is full of incredible fresh fruit and veggies. And oh, did I tell you about the tasty bread? Well, you don’t have to be hungry for long when there’s a fruteria and panaderia around every corner. A racion of patatas fritas. 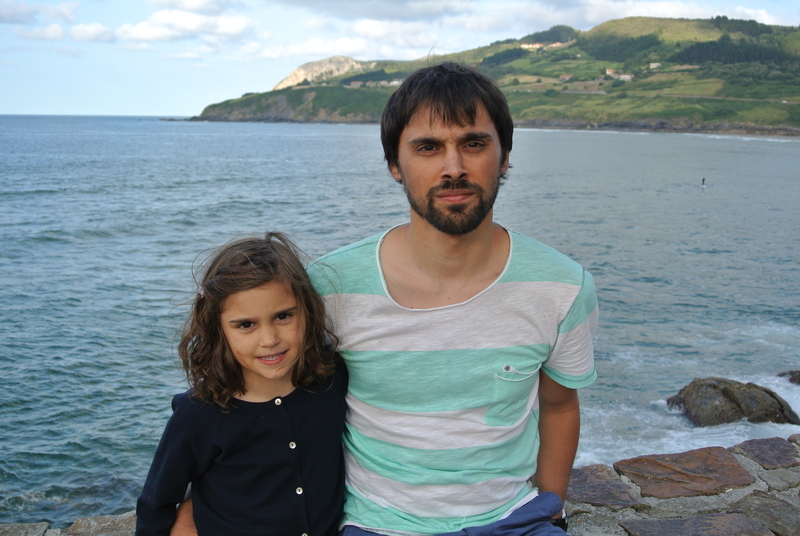 Beside eating we also enjoyed the sun in Mundaka, a small town by the sea famous for their great waves. A real surfers paradise! 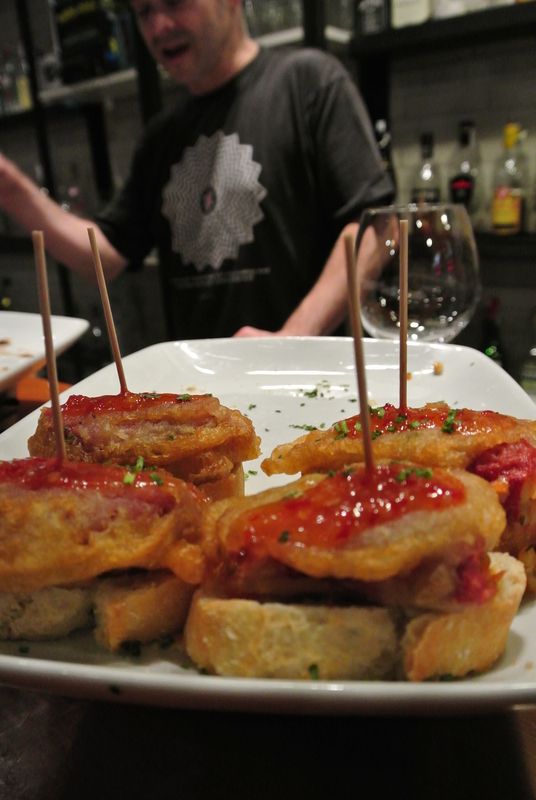 In Bilbao we enjoyed vegetarian pintxos at the bar Zuga. Typical Pintxo on bread with a stick. Another version with the bread on the side. 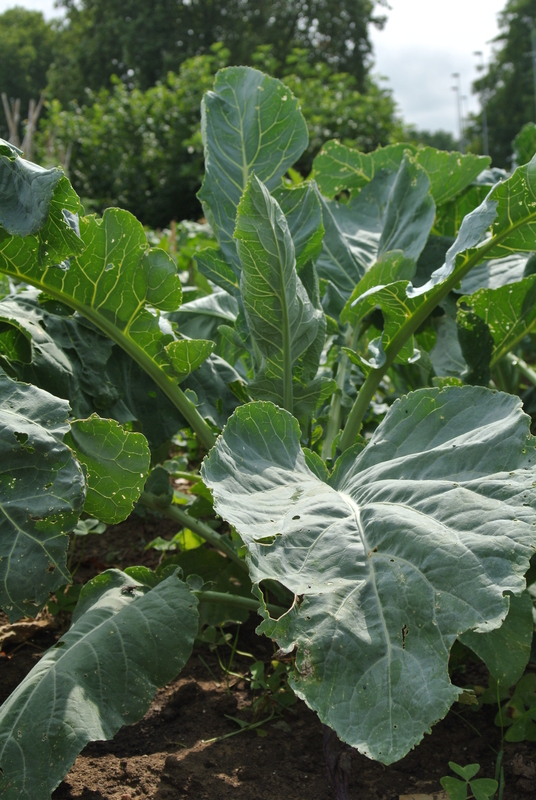 An old friend of Roberto has the most incredible huerta (a plantation or kitchen garden) that he manage with his family. 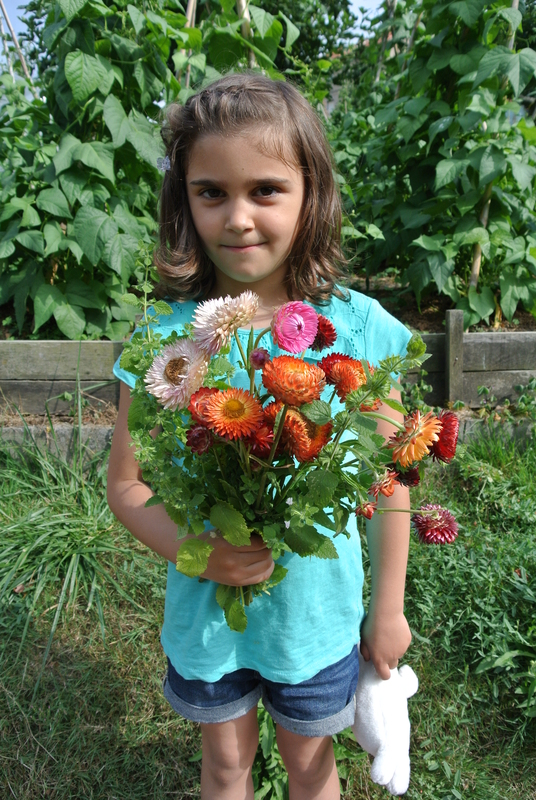 We love to visit and to look at all the crops growing. They have a big amount of different veggies and fruits. 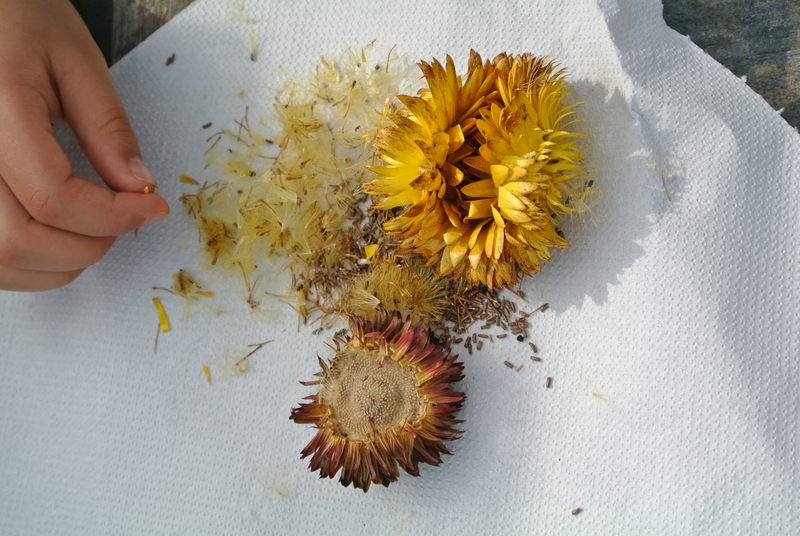 …and some seeds to bring home. Iris practising her skipping skills. Some of all the preserves that inspired me. Who can say no to delicious pastry? 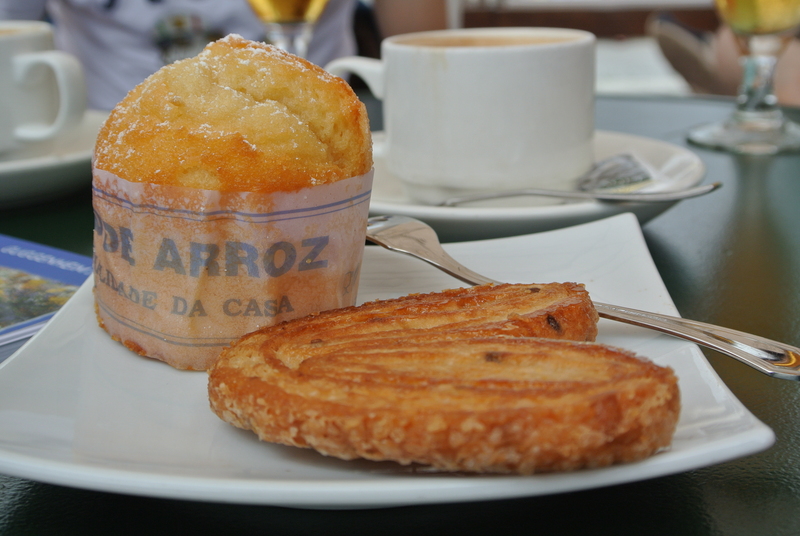 Bollo de arroz and palmera.